Snack on s’mores, gummy worms, and red juice while discussing the book. If we get stuck, use the discussion questions. Then split into two groups and play a Little Wolf-themed game of life-sized Candy Land. After you earn your Bad Badge, make a list of family rules to hang at home. We had 7 boys and 5 adults (3 moms, 1 dad, and 1 grandma). The boys came in and started on their s’mores right away. Gummy worm s’mores were a pretty big hit. After everyone arrived, we went around and everyone gave their opinion of the book. All of the boys and all but one of the adults who’d read it (not all of the adults did) enjoyed the book. Some of them found the epistolary format a little bit hard to get into, and the adults agreed that the humor was probably more appropriate for 10-year-old boys than for adults, but on the whole, they enjoyed it. We also discussed question #2 below. Most of the boys agreed that Little Wolf was part good and part bad (sort of like everyone, really), but they gave good examples from the text to support their positions. For the activity portion, we split into two groups. I wasn’t sure the Candy Land game (see cards and rules here and place cards here) could accommodate all 7 boys at once. To start with, three boys did Candy Land while the other four worked on their rules, and then we switched. For the Candy Land game, the boys had to follow the colored trail from Home to BAD Badge, passing by several places mentioned in the book. There were three kinds of cards for each color. “Badness” cards stated something bad you had done and sent you forward to the next space of that color. “Goodness” cards stated something good you had done and sent you back to the previous space of that color. “Challenge” cards had you complete a challenge and, if successful, move forward two squares of the designated color. It was nice to have the adults there to help out with the Candy Land – making sure the boys were taking turns, completing the challenges, etc. It took a reasonable amount of time to finish – about 15 minutes. For the house rules, I supplied thin rectangles of wood, parchment-y paper, scissors, colored pencils, and Mod Podge. 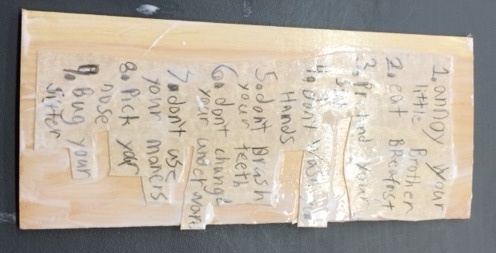 The boys cut out the parchment, wrote down their rules (some used the rules from the book and others wrote their own, but they all made “badness” rules), and then used Mod Podge to attach them to the boards and give them a nice finish. I had considered having them attach some sort of string or pipe cleaners so they could hang their rules, but once they were all wet with Mod Podge, it seemed too icky to attach anything else, so we left them as-is. This project also took about 15-20 minutes. What did you think of the Rules of Badness? What are some of the rules in your family? Little Wolf insisted that he was not really good, he was just pretending. What do you think? Did he really need Uncle Wolf’s badness lessons? Have you ever seen someone act differently than usual to make someone else happy? What did you think of Little Wolf’s made-up words? What words do you use that were invented by you or by someone you know? The letters in this book show only Little Wolf’s point of view. Why do you think the author chose not to include any responses? And, oh, how I wish we could get the Little Wolf movie here in the U.S.!